Affordable Accoutrements: Serendipity: Flavor of India! "India weaves a spell that inspires the imagination and enriches the perceptions..."
Serendipity - a propensity for making fortunate discoveries while looking for something unrelated. We are indebted to the English author Horace Walpole for the word serendipity, which he coined in one of the 3,000 or more letters on which his literary reputation primarily rests. In a letter of January 28, 1754, Walpole says that "this discovery, indeed, is almost of that kind which I call Serendipity, a very expressive word." Walpole formed the word on an old name for Sri Lanka, Serendip. He explained that this name was part of the title of "a silly fairy tale, called The Three Princes of Serendip: as their highnesses traveled, they were always making discoveries, by accidents and sagacity, of things which they were not in quest of…"
I was recently contacted by two artists for whom I have great admiration and respect. 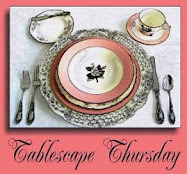 April Cornell (through a member of her staff) and Komali Nunna, who frequently participates in Tablescape Thursdays with Susan of Between Naps on the Porch, asked me to review their products for readers of Affordable Accoutrements. I selected a Genevieve Teal tablecloth from April Cornell’s gorgeous Fall 2010 collection, along with a Cornucopia Spruce table runner and napkins. It's always a very happy day when a package arrives from April Cornell! Where does serendipity come in? As I read about these talented women, I noted interesting similarities. April Cornell, a Canadian (who now makes her home in Vermont), was strongly influenced by her travels through India. 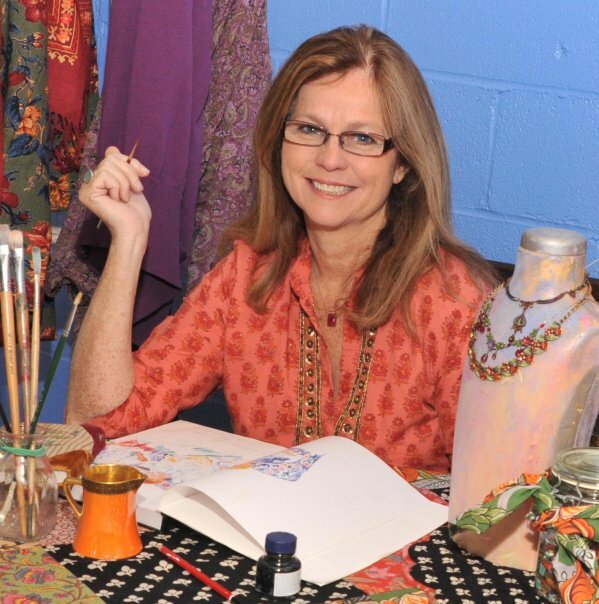 Many of her designs have an Indian sensibility, and her beautiful fabrics are produced there. Using nature's colors, lines, forms and shapes as her guides, April Cornell's designs are an inspiration to make an occasion of every day. All April Cornell linens are printed in India where skilled craftsmen combine age-old practices with the modern techniques to create beautiful, vibrant, rich fabrics for your home and furnishings. April Cornell linens are all individually screened, dyed and embroidered by hand: no two pieces are quite the same. April has many philanthropic passions including caring for the people in the company's core production region in India. 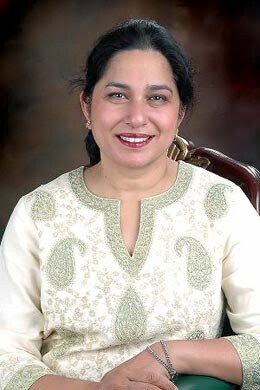 She actively supports the Concern India Foundation and is a trustee of the Giving World Foundation. Komali sent me a copy of her stunningly beautiful book, Entertaining From an Ethnic Indian Kitchen. I found it interesting that it arrived the same day as a package from April Cornell. A chemist by profession, Komali Nunna grew up in India and has spent her adult life living and entertaining beautifully in the United States (in California). Komali’s book offers readers an education in using vibrant fabrics and aromatic Indian cuisine to create memorable experiences for entertaining family and friends. Her unique, eclectic style is a fusion of Eastern philosophy and Western style. Books that are personalized and signed by an author are among the possessions I treasure most. Thank you, Komali. “This book not only has divine recipes but it gives the guidelines on entertaining as well. Note that the common denominator is the Indian cuisine and each chapter is supported by a different theme with different table setting ideas and how to create a memorable ambiance each time you entertain. My cookbook provides the recipes from India and entertaining ideas along with wine pairing (as you know, pairing Indian food with wine is not an easy task). This book, rather than concentrating on a specific geographic region of India like many other cookbooks, is a compilation of recipes from regions all over India. In addition, I have menus from both Indian holidays and American holidays. The American recipes are given an Indian flair. 320-pages, hardbound, with over 260 luscious photographs. As I unwrapped the beautiful April Cornell table linens and flipped through pages of Komali Nunna's richly evocative book, I began to envision a table setting unlike any I'd done before. I wanted it to have an exotic appearance and a feeling of ancient cultures merging in a harmonious way. Very little in the room is truly Indian (other than some home accent items from India via the local Hobby Lobby store). The vintage bird of paradise plates are Czech (the birds themselves are mostly found in New Guinea), and the birdhouses are Tunisian. The approach I took went beyond setting a pretty table; it became an effort to stage the room for an overall effect. I brought in furniture, rugs, artwork, and accessories from other rooms in the house. I layered fabrics, covered the windows with sheer curtain panels (on spring tension rods), brought in a fern from outside, and kept Komali's book close at hand for inspiration. April Cornell's designs are utterly timeless, somehow at once soothing and bursting with exuberance! I mixed and matched the silverplated chargers and the gold-rimmed glassware. The gold-plated flatware is by International Silver. I've had it for several years, but I've only used it once. Most of the pieces were still in the original plastic wrappers. Somehow it seemed right for today's table. I wanted variety (throughout the room) in terms of color, shape, texture, and style. Rather than doing large floral arrangements, I used tiny vases to hold hardy chrysanthemums from the garden and plumes of ornamental grasses. A bowl of fresh fruit always adds life and energy to a table setting. The block print was given to me by an artist of Mexican descent. She often depicts crows in her work and says her fascination with the birds stems from their near universality. Crows (and their kin) appear to have originated in central Asia and spread throughout Europe, North America, Africa, and Australia. Are we still in West Tennessee? I put a round, beaded placemat (made in India) in the center of the table to protect the runner and placed Lamb's Ear cuttings directly on the table. I liked the texture and the soft, silvery-green color. From Wikipedia: Stachys byzantina (syn. S. lanata; Lamb's-ear or Lamb's Ear) is a species of Stachys, native to Turkey, Armenia, and Iran. It is cultivated over much of the temperate world as an ornamental plant, and is naturalised in some locations as an escape from gardens. Lamb's Ear is a commonly grown plant for children's gardens or used as an edging plant, in Brazil is also used as a edible herb, called Lambari, as they are easy to grow and the thick felt like leaves are fun to touch. It has sometimes been used as a medicinal plant. I can hardly wait to try Komali's recipes. For now I'm enjoying the book as a visual feast, savoring the flavor of exotic India. The screen adds a feeling of intimacy to the space. I did the painting of (silk) flowers in a decorative clay pot several years ago. I removed the canvas panels and painted them on a flat surface (lying side-by-side). I sealed the surface first with acrylic gesso and used acrylic tube paints and large artist's brushes for the painting. I think using vintage/antique artwork contributes to the feeling of a room that's evolved over time. In case you're wondering, I did set the plumes on fire (briefly) when I blew out the candles. Definitely not a centerpiece to be left unattended! These Sidi Bou Said bird cages, named for the village in Tunisia where they're made, came from the estate sale of a local former US Congressman. The blue and white reflect the white walls of Sidi Bou Said buildings and the blue roofs and window trim/ornamental iron work. I sometimes burn small tealight candles in them, but even small candles generate heat. I wouldn't leave them unattended when they're lit. After cutting, the Lamb's Ear seems to last several hours without being in water. The teapot and daisies and the red and yellow rose were painted by a Tennessee artist, my friend Yvonne. She's definitely not one to shy away from dramatic depictions of her subject matter! Perhaps the glasses need to be filled with something festive and colorful. Until we read Komali's book, I have no idea which wine to serve with Indian dishes! Do you? This old coffee pot is one of my very favorites. The books came from a local estate sale ($3 for the set of four). Will I ever read them? I don't know, but they look great in a vignette, don't they? I used the "silver trays as chargers" trick at the end place settings (along with a pair of chairs that don't match the side chairs) to add interest. 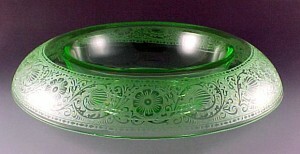 The china pattern reminds me of "Indian Tree," a classic pattern made for decades by a number of English potteries. The centerpiece looks complicated, but couldn't be simpler. I just clustered small bouquets around a candleholder and added fullness with fresh cuttings of garden greenery. How easy is that? So did I achieve my goal of creating an exotic-looking table setting using items collected over time and gathered from around the house? One more look. I decided to leave the table set overnight and show you how it looked in morning light. The table linens seem closer to their true colors in this situation (I suppose that's why artists' studios often have windows that feature northern exposures). Any of your readers who use that code will receive 10% off their order." Isn't that great? Ten percent off your order of beautiful April Cornell merchandise, just for being a follower of Affordable Accoutrements. Visit www.aprilcornell.com to see her latest collections. I can also recommend without hesitation Komali Nunna's gorgeous coffee table, cooking, entertaining book, Entertaining From an Ethnic Indian Kitchen. What a wonderful Christmas present/holiday gift it would make for a family member or friend who collects books on cooking, travel, tablescaping, etc.! Visit www.komalinunna.com for details. The book is pre-priced by the publisher at $50 USA (and looks as if it should cost $100!). Komali is offering it now for only $35. I hope you'll place your orders soon -- one for yourself and one (or more) to give as unique holiday gifts. Before you leave (I know this has been a long post), please take a few moments to watch this April Cornell short video. I'd admired her work previously, but I loved seeing this talented artist at work and sharing a lovely cottage setting. I guarantee you'll be charmed by her as well! 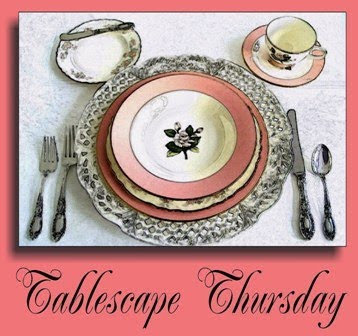 Please join Susan and all her talented tablescaping participants at Between Naps on the Porch for Tablescape Thursday. You'll be very glad you did! Wow...Stunning table, you have outdone yourself, Bill! You are great at evoking a feeling, in this case India, in your settings. Even when you mix in all the different pieces from different areas it still comes out the way you wanted - India. With complex Indian food you need a low alcohol wine. Something low in acid. A Gewürztraminer or a Pinot Gris (Grigio). What time should I be there? Ooops make that a wine with with more acidity not low. That is what happens when one comments before having their cup of coffee. Hi Bill! What a wonderful compilation of "items collected over time and gathered from around the house." Well done! I love April Cornell fabrics/designs, too! And thanks for the video clip... enjoyed it! Just as she says in the video that "cottage style can be anywhere," I think you have achieved your goal of an exotic looking table. Toto-We are not in Kansas any more! :) You have indeed created an entire environment and not just a table! The gold flatware is perfect for this setting and I LOVE the block print fabric! Komali's book looks beautiful and I know nothing about Indian cusisine--thanks for showcasing it! Beautiful as always! Oh my!.....oh, dear!.... *big sigh* I am speechless this time. Usually I have tons to say about your tablescapes, Bill, but I'm at a loss for words. That china with those chargers!!!! The BEAUTIFUL crystal!!!! That FABULOUS flatware!!!! I want it all & then some. *another sigh* I need to go lay down. It all just too much to bear. It is an elegant and eccentric house!! I love the colours in April Cornell linens, but sadly they are not available in the UK!! So beautiful Bill! Again you have given me some lovely ideas! I am now on the hunt for more silver trays to use as chargers! What is the greenery called that is in the middle of the table? It reminds me of sage or lambs ear, is it real? So pretty! The book and linens are divine! Bill your attention to detail never ceases to amaze me. Sheers on the windows to give a Indian effect...brilliant. Love the linens, April Cornell is a fabulous artist, and the china is gorgeous. Looks like a lovely book also. Thanks once again for your brilliance! Wow. This table turned out very dramatic and exciting. It's alive with color and and I can almost taste the food in your kitchen! What time did you say dinner was? I love how you were able to recreate all the elements from around your home. Very beautiful. Thanks for letting us peek into the book.. it's a delight too. Your blog is influential. Following your lead, I picked up 25 pieces of Spode Cowslip for $55 at an antique mall in Phoenix. Thanks for many interesting tables. This is really pretty. I love the silver chargers (and trays used as chargers??) under the dinner plates. I also enjoyed seeing the inscription in your entertaining book. Lovely. "You ALWAYS have so much going on in such professionally gorgeous tones"! I don't know where to start other than "TRYING" to narrow down to one or two favorites things. I'm going to say it's the tablecloth that brings the table together for me. LOVE IT ALL, "BUT" the "COLOR" of the tablecloth is incredible, AND next I'm LOVING those bird cages... Of Course April also is a part of my tablescapes, just about all the time. She is light, fun, and "OH" so different. She always brings a guarantee for compliments EVEN from the most curmudgeon of visitors! Thanks so much Bill for sharing with us, I always enjoy my visits with you! Beautiful table, Bill. I hope you enjoyed stretching your tablescaping skills. Nicely done! A very pretty table as always -- love the deep color of the tablecloths! April and her staff are so generous and gifted. I adore the treasures she sent you. And Bill, can't believe you outdid yourself. How can that be? Your tables are just THE VERY BEST! You totally transported me to an exotic and magical world. I love the mix of color, texture and the richness of the prints. You perfectly paired your dishes and glassware with the theme as well as the center of the table resplendent with birdcages and all sorts of green and glitz. Truely a work of art. The effort and care you set this table with is amplified in the final product. This is one to remember and aspire to!!!! A big hug to your for sharing this rare gem! Gorgeous! Every detail is perfect!!! I did have to laugh about the plumes catching on fire! Bill, you not only always achieve you goal, you go far beyond expectations!! Another beautiful table, and this one taking us to an exotic location. Gorgeous!! I am born and bought up in India . You are amazing in your talents and I so love seeing what you'll do next! 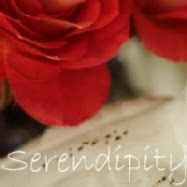 You know how I feel about "Serendipity"! Beautiful job on your table. Thanks for stopping by. I think you did a fabulous job. I love how you layered the room with rugs; it really enhanced the tablescape. The coffee pot as well as the silver chargers are e-x-q-u-i-s-i-te! I've always loved the colors of the Indian saris and the book looks great. I've seen her tablescapes before and they are always a visual treat. There is no one on earth as good at setting a beautiful table as you are, Mr. Bill. Your table scapes should be printed into a big, beautiful book. You just blow my sox off and this one...oh, this one is waaay over the top. I so appreciate all your hard work in making this post outstanding. Bill, those linens are really something, and I love they way they look with that set of china! I can't get over the colors... in some lights it looks blue and in others green... like a peacock. SO pretty. And of course the tablescape is just lush and lovely. Am just getting in from a LONG day, some spent with my godson, so I will keep this short, but I did enjoy looking at your handiwork. Such a beautiful table! Love all of the color and I've always loved April Cornell. She is an amazing artist. Bill! As always - goosebumps. What a beautiful tablescape and story. I'm sure Miss Cornell and Miss Nunna would love to dine at this table - me too! BREATHTAKING! Did I say that the last time? Still true. It must have taken you all week to do this. How fun to have a signed cookbook with wonderful new recipes to try. I lust after that birdcage. The way you write and presented my book along with April Cornell's table linens is just breathtaking. Thank you very much. I don't have enough words to explain how thankful and honored to be featured on your blog. I do hope you try some recipes from the book soon. How fortunate I am to be featured on your blog first and second on Vignette design. I am very blessed to find good friends like you. Thank you. yesterday evening I couldn't leave a comment and now I am late. I am a follower of Komalis Blog and I always enjoy her talents in decorating an cooking. I tried a lot of her showed recipes and all were really delicious. Your tablescape is outstanding and you have a good eye for combinging the right colors and ornaments. And your china ist gorgeous. You catched the spirit of India so well. What a fun post! How exciting that you were able to bring together April and Komali (who I thought were too different to put together) and make it work! Komali's book really does look exciting and I love the cloth you selected from April Cornell's line. Very very pretty! It was wonderful to read more about both of these talented ladies. Your china, flatware and chargers are beautiful and I love your house! You have the perfect place for entertaining. What a wonderful compilation of "your treasure collected over time and gathered from your pretty.Job well done! Bill - you are so talented -- you've set another lovely table and what a wonderful mixture of inspirations from both artists. You've put this all together in a marriage that only you could arrange! Exquisite indeed!!! Your talent really comes shining through on this table! This is such a sumptuous look! Oh my, I don't even know where to start. First, I was so glad to see the bird cages come back out. I remember them from your prior tablescape (maybe the first of yours I read) and how impressed I was with your style from that moment on. I could almost feel the thrill of opening both of those packages on the same day. The book looks beautiful and of course the April Cornell linens...to die for. You did a wonderful job of creating a mood. I can't believe how you move rugs, hang drapes etc. I'm lucky to just get the table set! I really love the softness of the centerpiece and the simplicity of the flowers. The china is perfect with the linens and for this theme. I also want to thank you for your kind words on my post. It means so much. You have a magic touch. Not much from India yet you manage to go from room to room gathering items to for this exotic, rich feel. Everything is just perfect. Perfectly executed and beautifully photographed. Gorgeous table, Bill! Komali's books is wonderful...I know you will enjoy it. Love the tablecloth you picked from April Cornell! You did a great job transporting us. Excuse me if I don't sit, I don't want my sari to wrinkle! A gorgeous and exotic setting! Fantastic!